Chapters 18 and 19 describe the various techniques used for attitude control. These techniques may be divided into two categories. Attitude stabilization, discussed in this chapter, consists of maintaining an existing orientation. 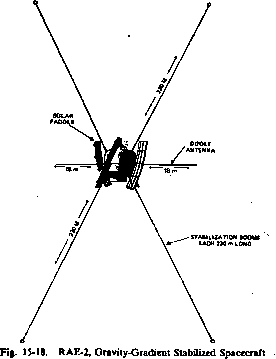 Attitude maneuver control, discussed in Chapter 19, consists of reorienting the spacecraft from one attitude to another. Although this is a convenient categorization for analysis, the two areas are not totally distinct. For example, we include in attitude stabilization the process of maintaining one axis toward the Earth, which implies a continuous change in the inertial orientation. Section 18.1 introduces the principles of control theory, derived largely from electrical engineering. Section 18.2 then describes the general principles of inertial guidance and reaction wheel control. Section 18.3 provides several specific examples of attitude stabilization systems. Finally, Section 18.4 describes both active and passive methods of nutation damping. Feedback, or closed loop control, is the process of sensing a system parameter to control its value—for example, using a thermostat to control the temperature of a room by regulating the operation of a furnace in response to a changing environment. Automatic feedback control is used for attitude control of many spacecraft. Using feedback control, commands to generate control torques are automatically issued to correct the spacecraft attitude whenever it has been sufficiently perturbed. Typically, the control torques are implemented by mass expulsion devices such as jets, momentum storage devices such as reaction wheels, or magnetic coils. A block diagram is a convenient schematic representation of either a physical system or the set of mathematical equations characterizing its components. Figure 18-1 is a typical spacecraft attitude control system block diagram. The blocks are the transfer elements which represent functional relationships between the various inputs and outputs. The operations of addition and subtraction are represented by a small circle, called a summing point. The output of the summing point is the algebraic sum of the inputs, each with its appropriate algebraic sign. A typical input for a three-axis stabilized spacecraft is a disturbance torque and the output is an error signal indicating the deviations between the desired and the actual values. The plant is that part of the control system which needs to be controlled, i.e., the spacecraft dynamics. The dynamic characteristics of the plant are generally determined by the specific hardware used. The disturbances are external torques which affect overall system performance. They can be either deterministic or random in nature. For example, gravity-gradient and magnetic torques on the spacecraft are deterministic in the sense that they are known functions of the spacecraft position and orientation. In contrast, the torques produced by the impact of metporoids are randomly distributed [Levinson, 1977], The output of the system, 0M, is measured, processed by the feedback loop of the control system, and compared with a reference or desired value, 0RLF, to obtain an error signal, 0 = 0M- 0REF. The error signal is processed by the controller to generate a control torque to counter the effect of the input disturbance torque and thus control the output 0M near 0REF (or 9 near zero). For convenience, we will normally assume that 0M is a measured attitude angle (although, in practice, it is usually a time or voltage) and set 0REF=0, so that 0 = 0M.